Long-term exposure to UV rays from the sun can lead to a number of skin conditions ranging from wrinkles, aging and discoloration to skin cancer. Terrai sunscreen provide superior broad-spectrum protection from both UVA and UVB rays. 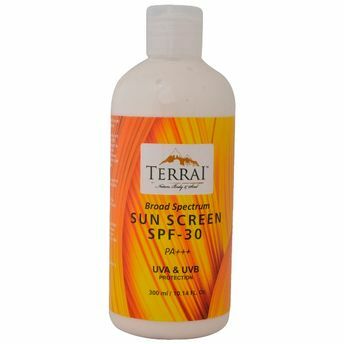 Zinc Oxide used in this formulation is an effective natural sunscreen agent, an anti-irritant and a skin protector. The barely there, tinted mineral formula evens out minor imperfections on the face and body.